Al Balooshi, leading the the first flight to Copenhagen. 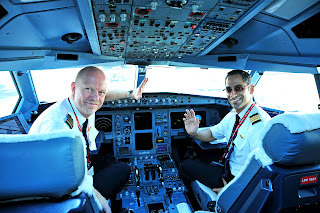 DUBAI, UAE – August 1st 2011 – Emirates has entered a new chapter by starting flights to Denmark and the land of famous story teller Hans Christian Andersen. Today's launch of a non-stop daily service to Copenhagen takes Emirates' own story into brand new territory as its first passenger service to Scandinavia. Aboard the inaugural EK 151 from Dubai were Richard Vaughan, the airline's Divisional Senior Vice President, Commercial Operations Worldwide; Salem Obaidalla, Senior Vice President, Commercial Operations, Europe & Russian Federation; Pradeep Kumar, Senior Vice President, Cargo Revenue Optimisation & Systems and Luc Delcomminette, Vice President, Arabian Adventures. Their guests on the first flight included Claus Rubenius, founder of RUBENIUS; Jens Lund, Chairman of the Danish Business Council in Dubai; Lars Oestergaard Nielsen, Managing Director, Maersk Kanoo (UAE) and an international media group. The Dubai-Copenhagen route, the airline's 114th destination, will be served by an A330-200 in a three-class configuration. Up to 17 tonnes of cargo can be carried in the belly-hold of each flight. In the cargo hold going into Copenhagen today were garments, fruit and vegetables from the Indian subcontinent. On Emirates' first flight out of Denmark, pharmaceuticals are being exported to Australia and the Middle East, along with seafood bound for the Far East. After touching down in Denmark under the command of Danish Captain, Lars Schoyen, Copenhagen Airport arranged for a water cannon salute before the VIP delegation joined a welcoming reception inside the terminal. Teddy Zebitz, Emirates' Area Manager Nordic Countries, led the proceedings, attended by Sheikha Najla Al Qassimi, the UAE’s Ambassador to Sweden; Per Tangsgaard Jensen, Danish Consul General to Dubai, Copenhagen Airports and other guests from the travel, business and aviation sectors. ”The route is great news for the many Danish and Scandinavian businesses that are operating in the growth markets of Southeast Asia, India, and Australia. It will also help attracting both business travellers and tourists to Denmark,” said Carsten Noerlund, Vice President, Sales and Marketing, Copenhagen Airports. 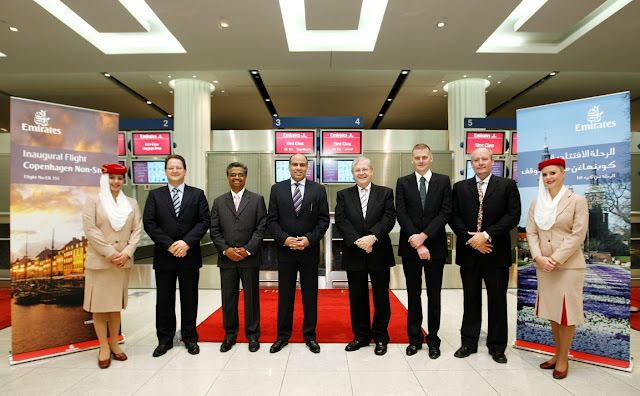 “Emirates daily route, via Dubai, opens up South Asia, Australia and Oceania for Denmark and southern Sweden. It gives businesses here significant benefits and will facilitate their access to new markets and encourage further internationalisation,” said Lars Bernhard Joergensen, CEO of Wonderful Copenhagen and chairman of the route development programme, Copenhagen Connected. “There is also considerable potential for tourism that we look forward to realising. The destination marketing that we do with Emirates in Asia and Australia in the coming years will contribute to realising that potential,” added Mr Joergensen. Bookings for the first flight into Denmark certainly match the hopes of Wonderful Copenhagen. Reservations have come from a diverse list of cities, such as Melbourne, Jakarta, Seoul, Guangzhou, Hong Kong, Singapore, Cape Town, Accra, Dubai and Bahrain. Staffed by highly trained and multi-national cabin crew, EK 151 leaves Dubai each day at 0830hrs and reaches Copenhagen at 1310hrs. The return flight, EK 152, takes off from Copenhagen at 1455hrs and lands in Dubai at 2315hrs. “The inauguration of Emirates’ service between Copenhagen and Dubai strengthens Denmark’s international availability and access to global markets,” said Michael Svane of the Confederation of Danish Industries. “Good flight connections to and from Denmark are crucial for Danish business and will have greater impact for Danish exports in the future, and also for the total Danish wealth creation. The new service cements Copenhagen Airport’s position as a regional hub with attractive intercontinental flights. We welcome Emirates’ new route,” he added. There are almost 100 Danish subsidiary companies established in the UAE with about 80 agents/distributors for other Danish companies. Also, more and more delegations from Denmark are regularly visiting the UAE. Tonight, Emirates will host more than 400 guests at a gala dinner at the National Museum of Denmark in Copenhagen to celebrate the start of the new service. So far in 2011, Emirates has launched passenger flights to Basra and Geneva. Services to St Petersburg will be launched on 1st November, followed by Baghdad on 13th November. Thank you Blogger. I enjoy reading it and I hope you will continue to read.. Love your blog, keep writing!!! !